Resource center Finding Treatment for Crystal Meth Addiction How Long Does Crystal Meth Withdrawal Last? Crystal meth is a glass-like formulation of the potent and highly addictive stimulant drug methamphetamine. Commonly referred to as ice or glass, crystal meth is usually smoked through glass pipes or melted down and injected. Medical News Today warns that crystal meth is highly addictive, even after very few uses. As a powerful stimulant, crystal meth quickly interacts with brain chemistry, increasing levels of dopamine and raising heart rate, blood pressure, respiration rates, and body temperature. Dopamine is a neurotransmitter the brain makes and uses as a chemical messenger to send signals throughout the central nervous system, helping to regulate moods, movement abilities, and sleep functions. Elevated levels of dopamine cause a surge of pleasure, or a high. The dopamine spike caused by the introduction of crystal meth can be extreme, and the high can be very intense. The US Department of Justice (DOJ) publishes that a meth high can last around 12 hours. It can be unpredictable, leading to impaired judgment, insomnia, decreased appetite, heightened energy, and even potential aggression, violence, paranoia, and other psychotic symptoms. A crystal meth “crash” can be equally significant, leaving a person feeling emotionally low, lethargic, and fatigued. It’s likely that they will have trouble concentrating and focusing. When meth wears off, withdrawal symptoms can occur. Crystal meth withdrawal can be emotionally intense, and it may cause a person to engage in erratic and unpredictable behaviors. Medical detox is the safest environment for a person to allow the crystal meth to process out of the body, surrounded by mental health and medical support. The National Survey on Drug Use and Health (NSDUH) reports that 684,000 people aged 12 and older in the United States struggled with addiction involving methamphetamine in 2016. Physical dependence and withdrawal symptoms are common side effects of addiction. Addiction is a brain disease that impacts brain chemistry, which in turn involves behavioral aspects, including a lack of control over drug use. A person battling addiction will struggle to stop taking crystal meth even if they want to. Drug cravings and withdrawal symptoms, some of the primary hallmarks of physical drug dependence, make stopping the drug difficult without professional help. Long-term use of crystal meth can cause potential psychotic symptoms, such as hallucinations and paranoia. It can also increase the risks for developing Parkinson’s disease, which is a nerve disorder that impacts movement abilities. In general, crystal meth withdrawal symptoms will peak in two or three days after stopping the drug and start to taper off about a week or so later. The National Institute on Drug Abuse (NIDA) warns that some of the emotional symptoms and cognitive issues related to chronic meth abuse can persist for weeks, months, or even up to a year after discontinuing the drug. Some of the damage to the brain may not recover completely with abstinence. Medical detox can help to lessen the severity and duration of crystal meth withdrawal with supportive care. While there are no specific medications that are approved for meth addiction and dependence, certain medications may be helpful for specific symptoms. For example, a sleep aid or mood stabilizer may be helpful for sleep difficulties and emotional distress during crystal meth withdrawal. ❖ Day 1: Within 12-24 hours, meth will process out and a crash may ensue. ❖ Days 2-3: Withdrawal symptoms will intensify, and mood swings are significant. ❖ Days 3-7: Some of the intensity of the withdrawal symptoms will begin to decrease. ❖ Week 2 through a month or so: Difficulty feeling pleasure, mood swings, thinking and memory issues, drug cravings, and sleep issues can persist to a lesser degree. Violence, aggression, and the potential for self-harm or violence toward others can be factors in crystal meth withdrawal. A medical detox program can help to manage the intensity of the mood swings and ensure the safety of everyone involved by providing a secure and supportive environment. A medical detox program typically lasts about a week until most of the withdrawal symptoms are largely controlled. Then, a comprehensive addiction treatment program can continue to support and manage crystal meth withdrawal into recovery. Crystal meth can have neurotoxic effects on the brain, which can permanently damage dopamine receptors, a study published in the journal Drug and Alcohol Dependence reports. A complete and specialized crystal meth addiction treatment program can teach clients coping strategies and methods for improving quality of life. These skills can help to sustain abstinence to prevent further damage to the brain and body. 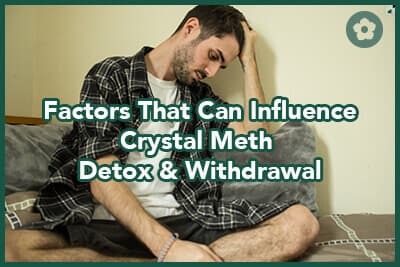 Crystal meth withdrawal symptoms and the detox timeline can look a little different for each person. There are several things that can influence the general timeline and specific withdrawal symptoms. For example, one person may metabolize the drug differently than another, which can impact how long it takes the drug to wear off and how much the drug effects the person in specific doses. Other biological factors, such as genetics and a family history of drug dependence and addiction, can increase a person’s potential risk for struggling with addiction. Environmental factors, such as high amounts of stress created by an unstable or chaotic home environment and low levels of support, may extend the withdrawal timeline while the reverse can also be true. High levels of support and encouragement as well as a stable environment, such as the one provided through a medical detox program, can help to manage and minimize withdrawal symptoms, which can influence withdrawal duration, possibly shortening it. One of the main factors impacting crystal meth withdrawal is the level of drug dependence. This is influenced by the length of time a person has been using the drug, how often they take it, how much they take at a time, and how the drug is abused. Smoking and injecting crystal meth can increase drug dependence. 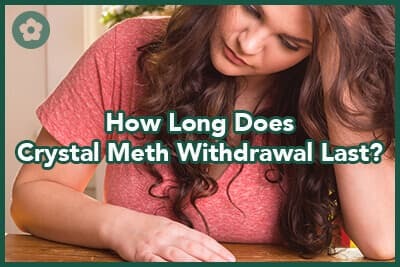 Taking other drugs with crystal meth can complicate withdrawal and lead to more side effects and risk factors as well as potentially extend the overall withdrawal timeline. Medical issues or the presence of a co-occurring mental health disorder can also play a role in more significant withdrawal symptoms that may last longer.